Storm Update: On Our Way! We are leaving Wisconsin and we are on our way to Chicago to help people affected by the recent polar vortex. We love helping getting people back on their feet and making it "Like it never even happened." 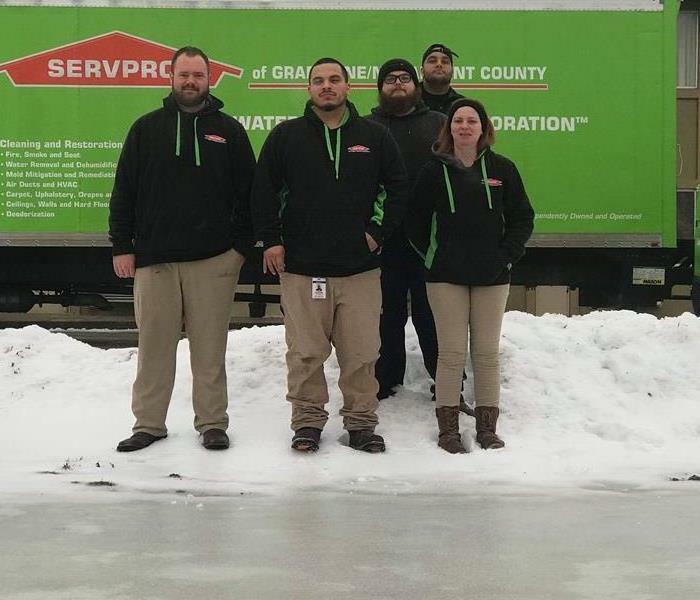 Our team which includes Dakota, Mike, Travis, Tabitha, Max, and Ashlynn is out in force in Wisconsin following the massive polar vortex that swept through the nation two weeks ago to help those who are in need! 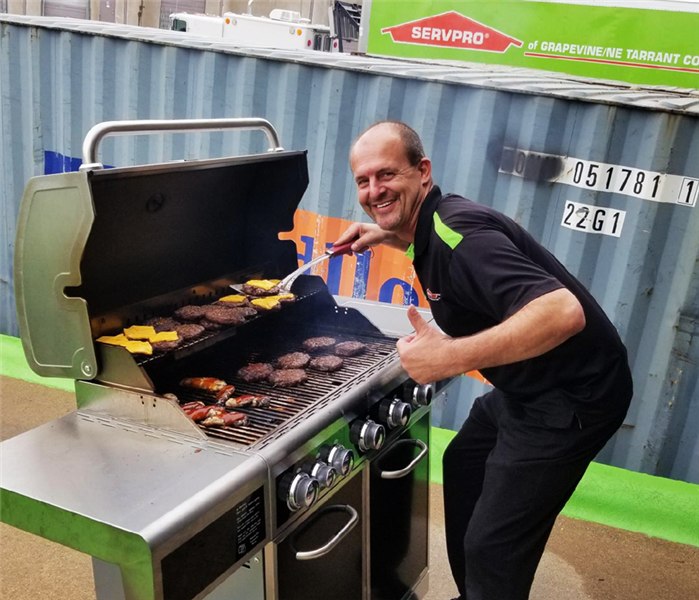 We want to extend a very Happy Birthday to Shane Parish, our fearless leader here at SERVPRO of Lake Worth/Benbrook. Here is to many more years, and birthdays at SERVPRO! It's overwhelming to have water standing like this in your place of work. We know that, and that's why we here at SERVPRO of Lake Worth/Benbrook is always here to help. Do you happen to have a spot like this on your ceiling? That could be a sign of water damage. 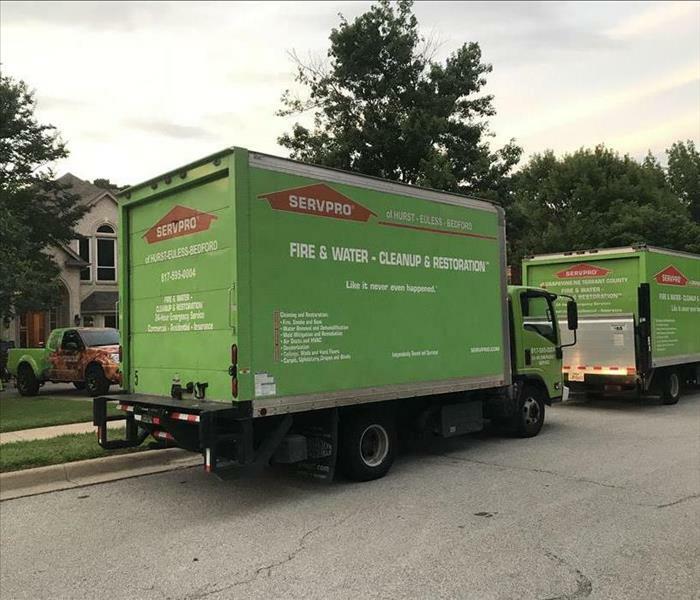 We here at SERVPRO of Lake Worth/Benbrook can take care of those water spots, and identify and possible underlying issues in your home to make sure it's a safe, clean environment for you and your family. Did you know we've been around since 1967? That's 52 years of helping people get their houses back in order after water or fire damage! We have the experience, training, and equipment to make it "Like it never even happened." Ready for any sized job! 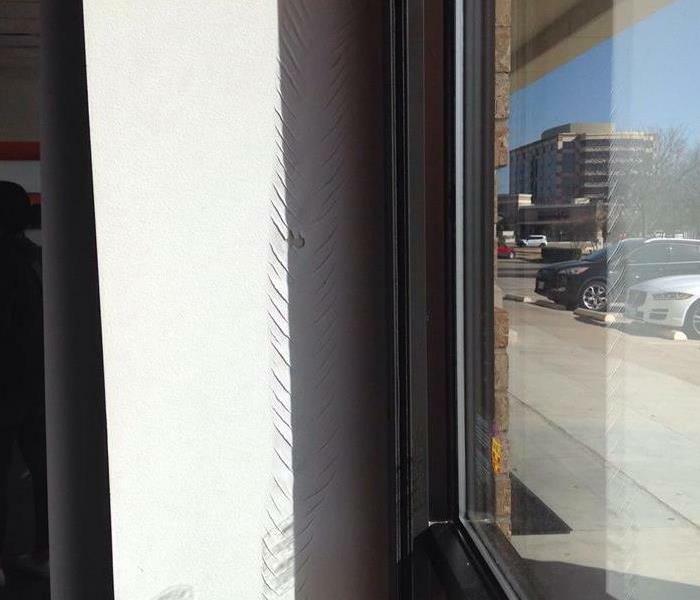 Failing window seals at this store allowed water to leak in and cause damage to the building. The water caused paint to bubble and saturated the floor. 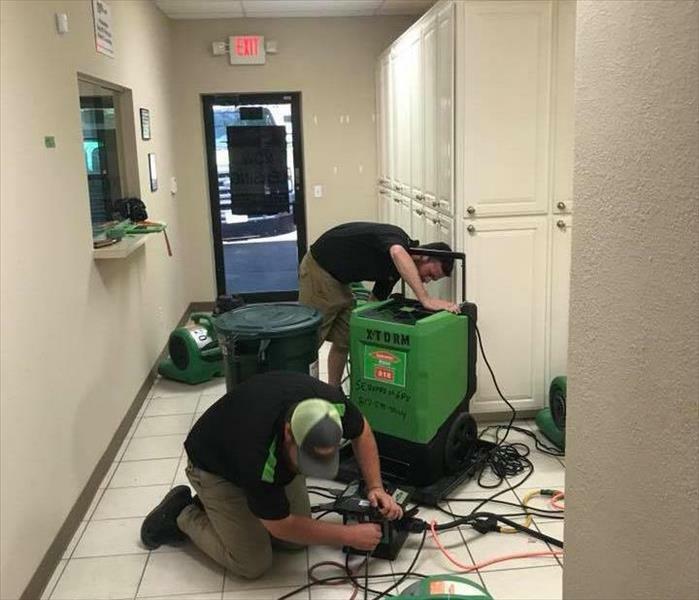 No job is too big or too small for us, so call SERVPRO of Lake Worth/ Benbrook today at 817.560.3086 to help your business get back in working order! Our technicians are always ready! 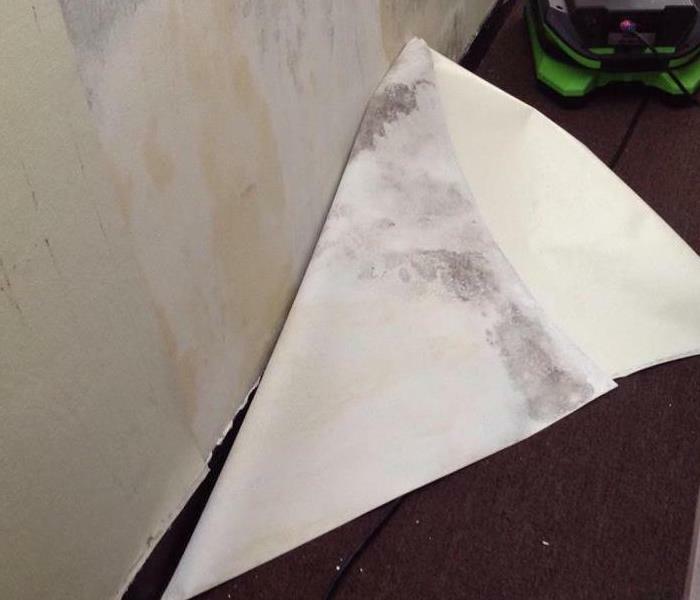 Here is one of our techs handling some pretty severe water damage at a health clinic. There were 5 room with extremely contaminated standing water, but we were able to take care of the situation and leave the owner feeling extremely pleased with our work! Give us a call today at 817.560.3086 if your commercial building suffers a loss. This terrible damage was left after a fire started in the garage of someone’s house. Though the damage was horrible, and smoke and soot permeated the entire house, our team was able to work with the homeowners to make sure everything got cleaned up and restored to preloss conditions. We were even able to restore personal items such as priceless hats that belonged to the owner’s father. 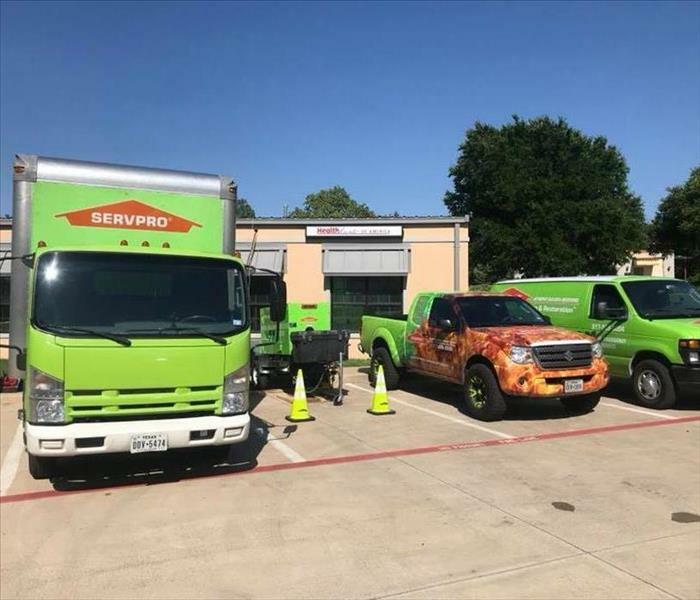 For help getting your residence back to normal after a fire loss, call SERVPRO of Lake Worth/Benbrook today at 817.560.3086. 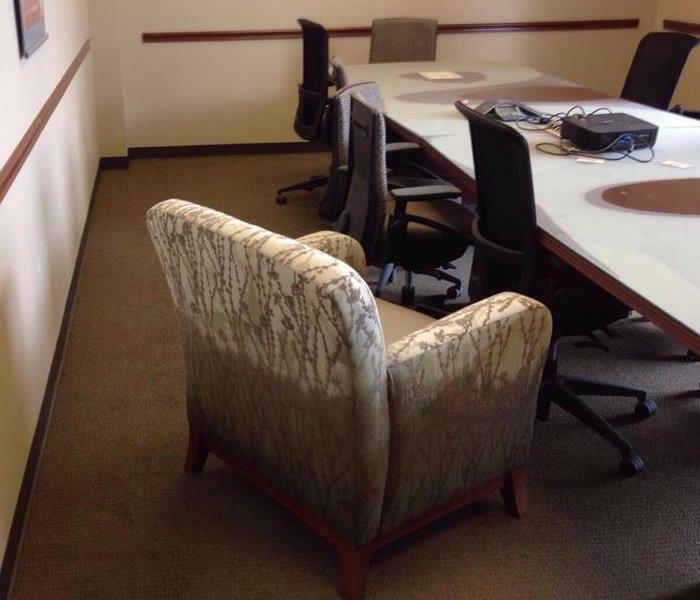 Here is an example of the stains that can be left behind after a fire occurs. 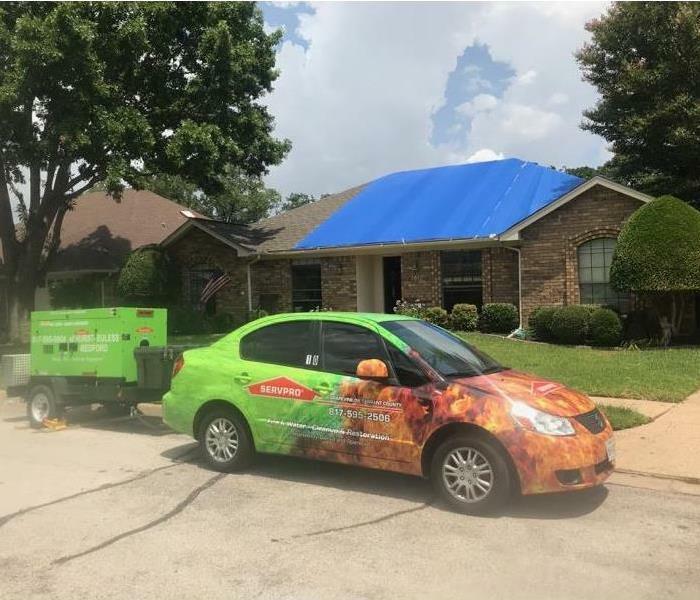 Our team of highly trained technicians were able to get the entire house cleaned up made it look “Like it never even happened.” If your home or business suffers from fire damage, call 817.560.3086 to find out how we can make your building look as good as new. Storm? We've got your commercial business covered. 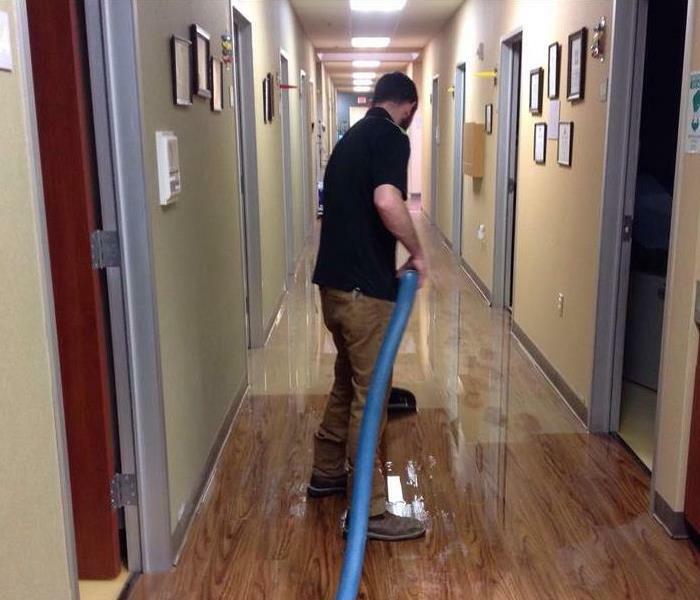 Texans are no stranger to heavy storms, so when this office building flooded due to heavy rains, our technicians were ready to step in and help out. 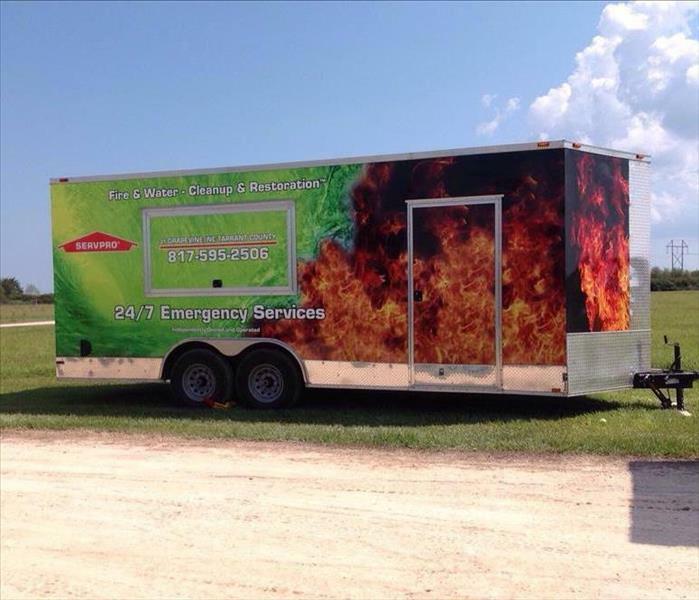 Since SERVPRO of Lake Worth/Benbrook is a Large Loss Response Team, we are ready for any size disaster. Call us today to see how we can help your office or commercial building recover from a devastating storm loss. Hurricane Harvey carved a path of destruction across Texas when it arrived in 2017, and, unfortunately, this home was unable to escape its wrath. This pile of debris was left after wind tore up the roof, and water was able to leak into the house. Our team of expert technicians was happy to help this homeowner begin the process of recovering from this terrible storm. If you have suffered damage from a storm, call SERVPRO of Lake Worth/Benbrook today at 817.560.3086 to get your life back on track. 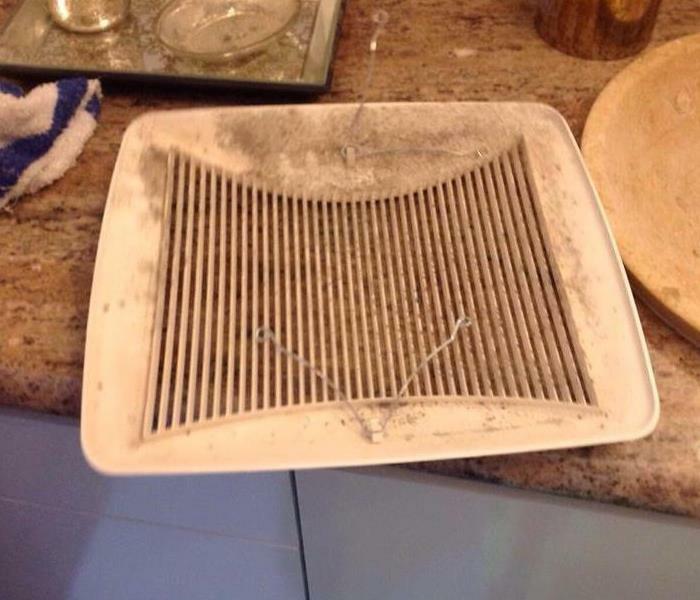 Mold in your vents? Not a problem! Mold occurs naturally in our environment and be found both indoors and outside, and it loves to grow in warm, soggy environments. This mold was found inside the vent of a bathroom. If you suspect that your home my have a mold issue, don’t hesitate to call us at 817.530.3086 to make sure that any concerns are taken care of quickly. This microbial growth was hidden behind a linen basket after storm damage caused water to leak into the house. 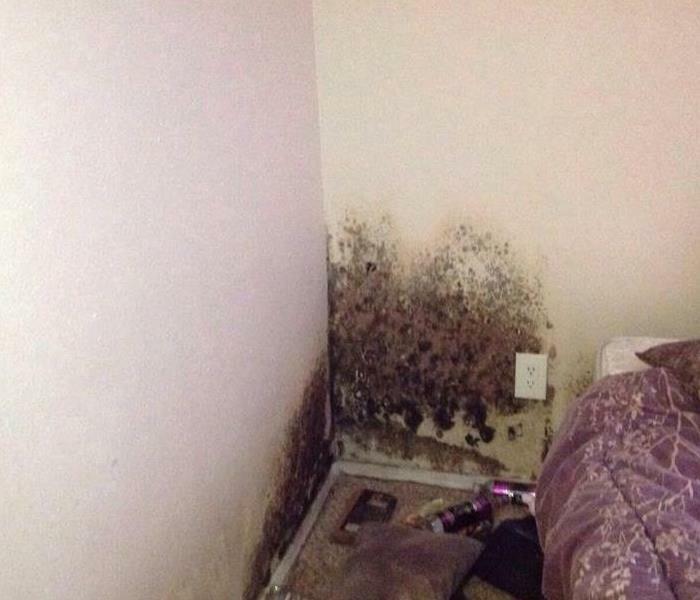 Mold is able to grow wherever a warm, humid environment exists, so call SERVPRO® of Lake Worth/Benbrook to make sure that water damage and mold growth are taken care of properly. 817.560.3086. 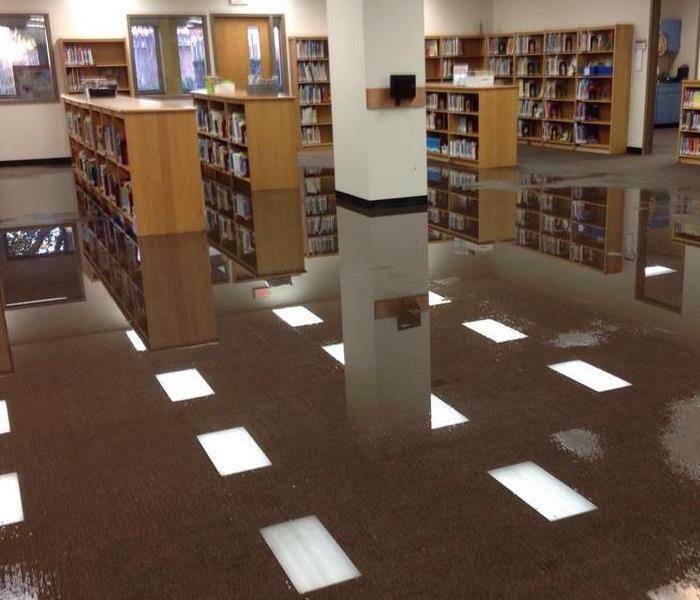 Flooded Break room? No problem! 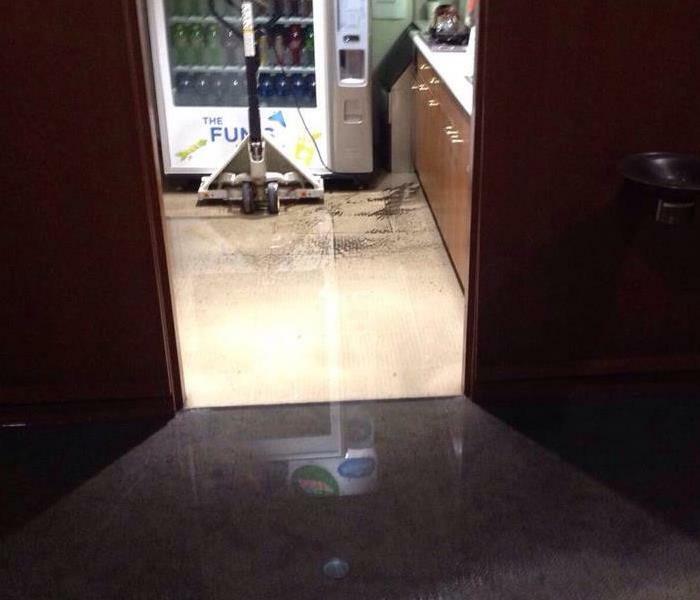 This breakroom flooded, so SERVPRO of Lake Worth/Benbrook was called in to get rid of the damage. We responded quickly to prevent this water from causing any further damage to the office building. Call us at 817.560.3096 to have our team quickly and thoroughly fix any water damage your home or business has suffered. Peeling or bubbling paint and discoloration are two huge signs that your home may have water damage. If you notice these things in your house, check right away to make sure that there are no leaky appliances or burst pipes in your home. If you have suffered from water damage lie this, give us a call at 817.560.3086 so we can help you get your home back to normal. Nothing is worse than an unexpected water loss at your commercial business location. Sometimes, however, problems with power can come with water loss. That’s why we have multiple generators on standby to make sure your business gets drier faster, and you don’t have to worry about lost revenue. 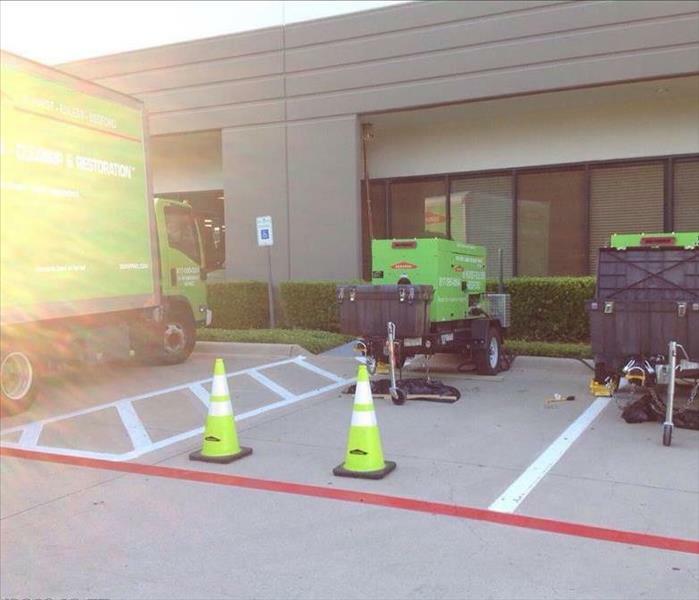 If you’ve suffered from a water loss in your business location call us today at 817.560.3086! This much water can be DEVASTATING for businesses! That's why we are available 24/7 to make sure your business can reopen as fast as possible. If your business has suffered from water damage give us a call today at 817.560.3086! One of mold's favorite places to grow is office ventilation systems! It's humid, dark, and moist, which makes it the perfect spot. Just like this office building, where mold was growing from the vents. We were able to get in and get it remediated! 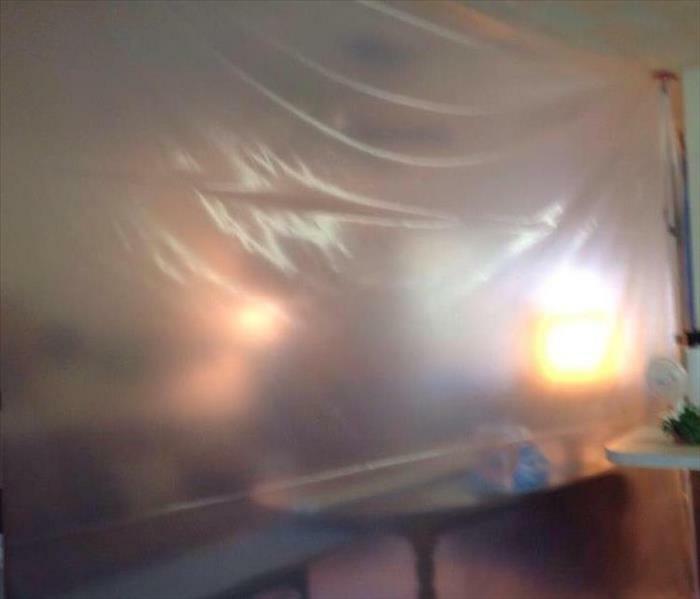 If you think your business has a mold problem, give us a call today at 817.560.3086! We see a lot of water calls here in North Texas, but we rarely see anything like we saw with Hurricane Harvey! 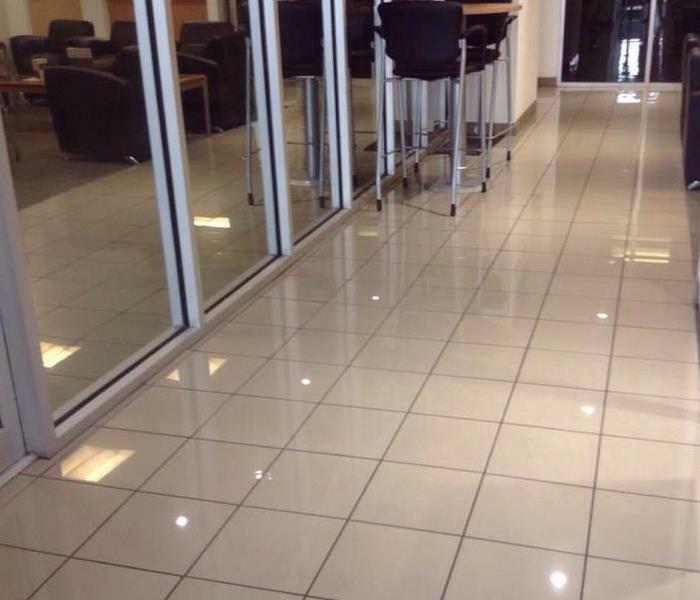 If you look close enough you'll see that's not just a highly polished floor, but it's got a LOT of standing water. For jobs like this we have special truck mounted extractors that can hold thousands of gallons of water. We saw some seriously crazy stuff when we were down south helping with Hurricane Harvey, like that fish! This was how high the water rose in this particular commercial building - you can even see it still pooled on top of the table! 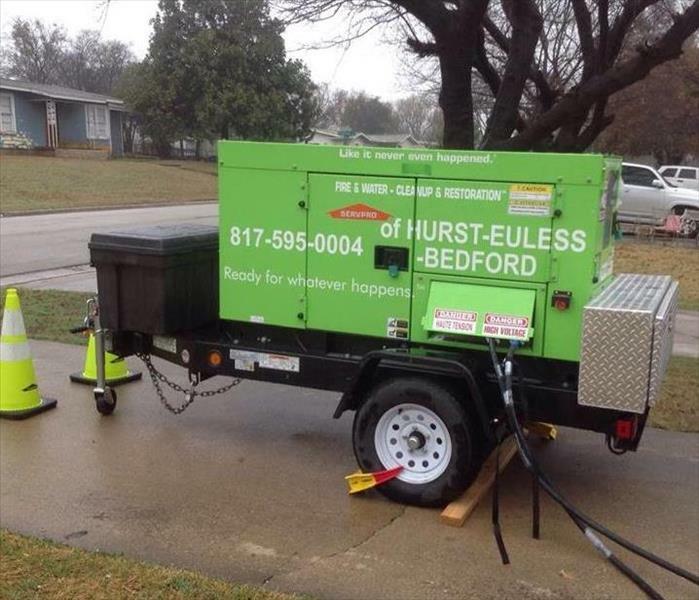 Did you know that SERVPRO of Lake Worth/Benbrook is apart of a special team that helps with large storm events? We help other SERVPRO franchises with the overflow that they may have. Last year you could find our team down in the Houston area helping with Hurricane Harvey, for example! 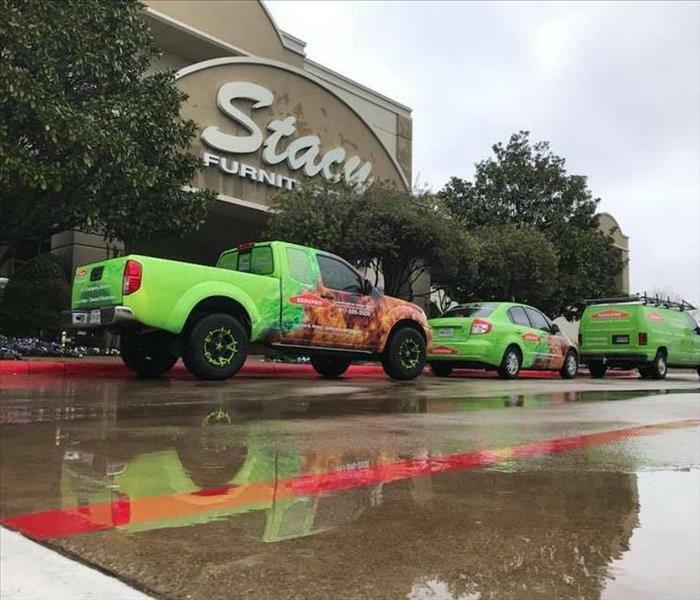 We here at SERVPRO of Lake Worth/Benbrook are apart of a special team that helps other SERVPRO franchises during large storm events, like for example, Hurricane Harvey. 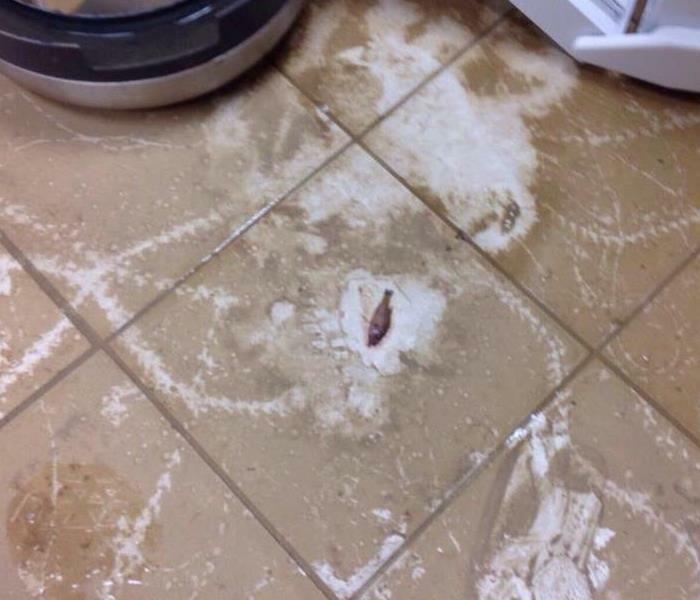 This particular job saw a lot of flood water enter their commercial business and when the waters receded and we extracted we found this little fish! We see some crazy stuff, and this one definitely took a top spot. 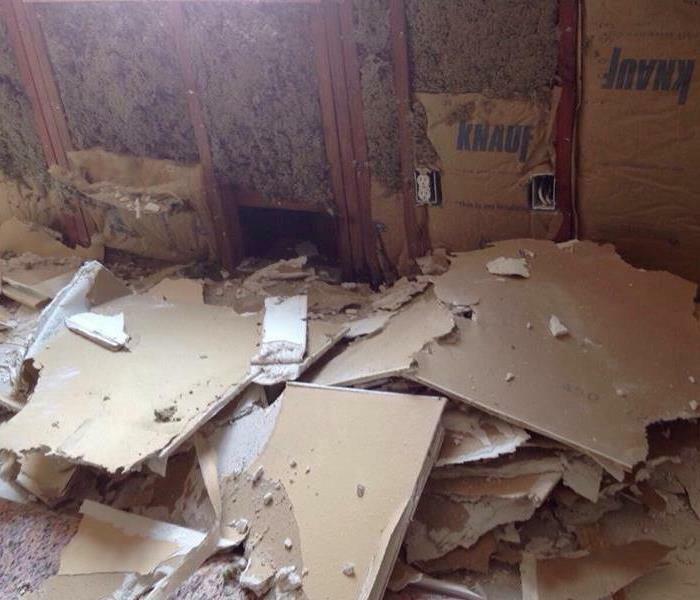 Often times mold isn't found until after we do our demolition and tear out work, much like this particular home where we had a water damage occur. That's why it's important to get leaks fixed immediately and to call us so we can get your home dry so you don't have any surprise mold. If you have, or think you may have, mold, give us a call today at 817.560.3086! 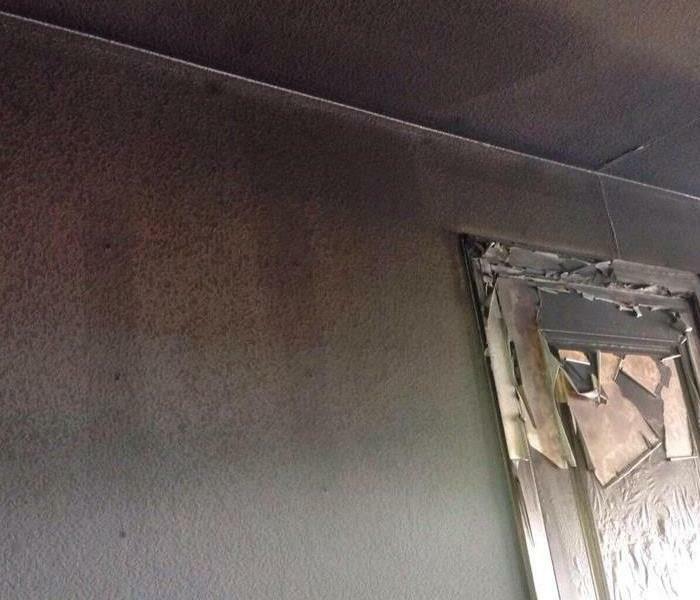 This was a home that had suffered from a fire in their game room from a incorrectly wired ceiling fan. It's interesting to see how the smoke and soot stay primarily to the ceiling of the home. There's an almost perfect line! If you or your family have suffered from a fire give us a call at 817.560.3086 today! We're here to help! Did you know that we provide protective coverings for homes or businesses that have been affected by fire or storm damage? We do everything we can to make sure your home or business is secure against the elements and unwanted visitors. If you've got a bit of a mold problem, you may be worried about the possibility of it spreading to another room in your home or belongings when it's in the process of remediation. We understand your concerns, and we take you and your family's safety seriously which is why we put up containment to prevent spores from spreading while we do our work. That is a lot of mold! This was a tenant in an apartment complex that went on vacation and returned home to a LOT of mold. We got the mold remediated so she could return to living in a safe and clean environment. Did you know that we provide our services 24/7? 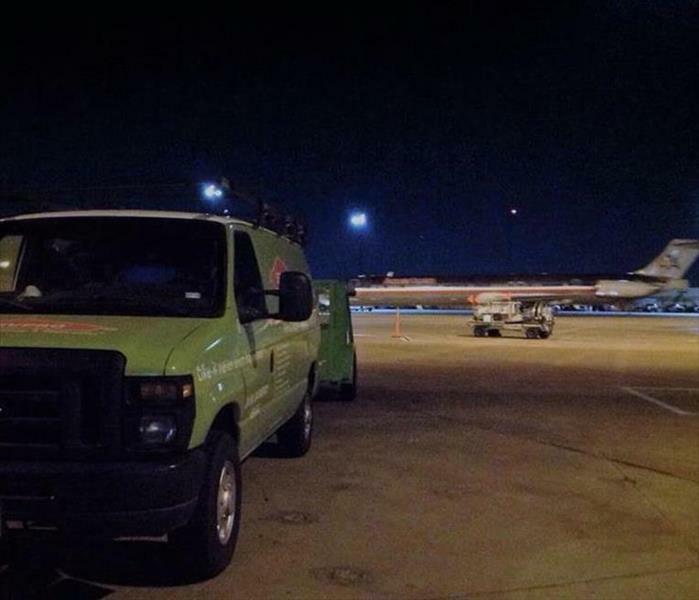 Just like DFW Airport, we can come and clean or do any remediation that needs to be done overnight! That way your commercial business doesn't have to close and potentially lose revenue. At this particular job we were called out to do some overnight remediation of some unwanted grease and mold from a pipe that had a slow leak in it. Commercial losses are no joke, which is why we have a fleet of cars, box trucks, and vans to make sure to get enough of the right equipment to your location so you can reopen faster. Give us a call today at 817.560.3086 if you've had a commercial water loss! Sometimes even local staples have water or fire emergencies, and we are always here to help! We will arrive to your location as fast as possible to get started on mitigating whatever happened. Give us a call today at 817.560.3086! When you have a loss in your commercial building, we are on our way ASAP! We know that any time your business is closed due to an emergency like water damage, that revenue is lost. We work hard to get you back open for business quickly so you don't have to worry. If your business has suffered from water damage give us a call right away: 817.560.3086 we are here to help 24/7! If your property has suffered a water loss, and power needs to be shut off (for example, you have electrical sockets in your floor and standing water, which can lead to shortages) don’t worry! We have generators available to hook up our equipment to get the water mitigated and get you back on track. Sometimes, the containment of your items is necessary! For example, this particular home was subject to a bad fire. After cleaning the items, we moved them to the garage and covered them in painters plastic, which we then secured to make sure no remaining soot or debris found it’s way onto the freshly cleaned items. 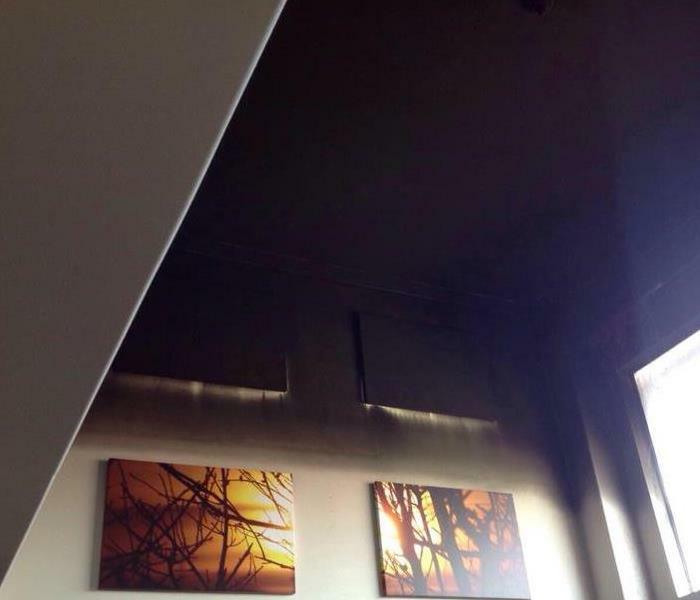 It's interesting to see how soot and smoke fall in a home after a house fire, like the shadow of these picture frames that were removed from the wall after the fire. This particular fire was started by an electrical short in a ceiling fan in a game room right next to the staircase. We take dying seriously! Our air movers are like high powered fans that move air along a wet surface to dry it. We place them in critical spots around the affected area. They help us get your home back to normal, faster! 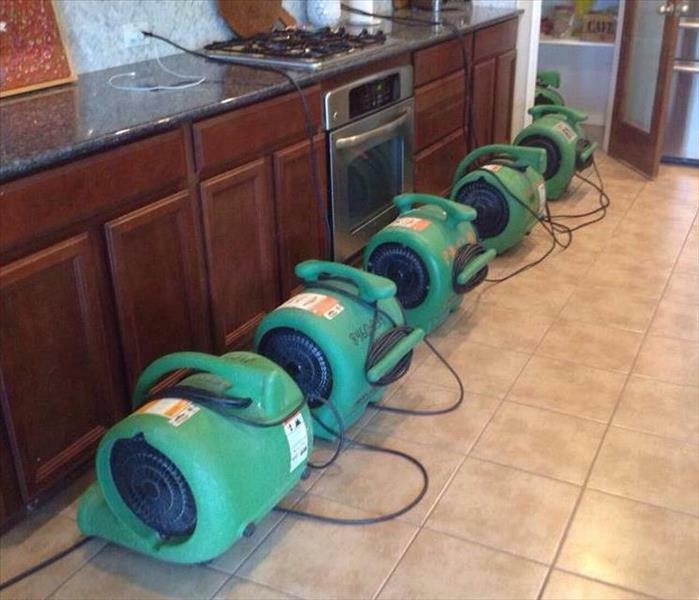 A family called us one morning when they had discovered 2 inches of water had flooded their home. As soon as they hung up the phone our team was mobilizing! We were on the scene ASAP and helped them get their lives back in order. We received a call from a pilot who had returned home after several weeks away. Unfortunately, he returned home to four inches of standing water throughout his home. What was a bad situation could have turned worse, he had electrical outlets in the floor, causing the water in the sockets to boil! We were able to turn off power to his home and save it ultimately from a house fire due to an electrical short. Our owner, Shane and our team responded quickly to get the water out of the home, and getting the home owner back to dry!